Good morning! We’re halfway through the workweek already. The days have been flying by which is kind of nice. Today I’m sharing a lower body workout. 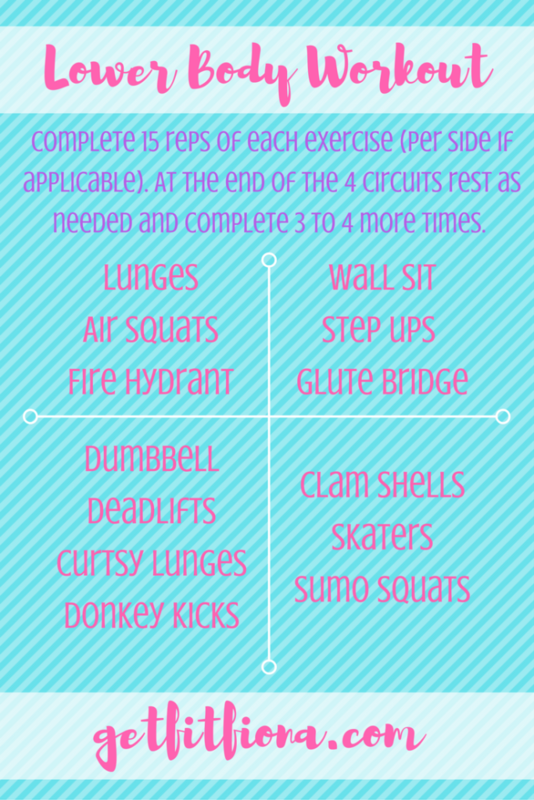 For each exercise, complete 15 reps before moving onto the next one. For moves that are done on one side (fire hydrants, step ups, donkey kicks, and clam shells) do 15 reps per side before moving into the next exercise. Once you’ve done all 12 moves, rest as needed and go through them again 3 or 4 more times for a complete workout. Lunges // Stand with feet hip width apart. Step forward with one foot so that the forward leg’s thigh is parallel to the ground, and the back leg’s shin is parallel to the ground. The back knee shouldn’t touch the floor. Use your quads and glutes to step the front foot back towards your back foot and end by standing straight up with feet hip width apart again. For the second lunge step forward with the other foot. Continue alternating legs for the entire 60 seconds. Fire hydrant // On your hands and knees with hands directly below your shoulders and youe knees directly below your hips, move your knee away from the floor and your body so that your thigh is close to parallel to the floor and at a 90 degree angle to your torso. Lower your knee back down to the ground in the starting position. Repeat. Dumbbell deadlift // With a dumbbell in each hand. Stand with your feet shoulder width apart. Slowly bend forward at the hips, letting your arms hang down and keeping your back straight. Using your glutes, lift your torso back up to the starting standing position. Curtsy lunges // Similar to a backward lunge, if you’re stepping back with your left leg, instead of keeping it to the left of your right leg, you bring it to the right side, so that it crosses the right leg behind you. Make sure you check with your doctor before beginning to workout. As with any workout, honor your body and modify as needed. For more workouts check out my workouts page.